Scenario 1: You have a deal with a Japanese record label that is committed to doing and paying for significant promotion for you in Japan. Scenario 2: You have a deal with a small indie Japanese record label that does very little marketing/promotion for you in Japan. Scenario 3: You do not have a deal with a Japanese record label, but you can get your music distributed to the main Japanese music stores (i.e. iTunes, Amazon) using a digital distributor such as CDBaby, TuneCore, ReverbNation, SongCast, etc. Of course, Scenario 1 is the best situation for you, but not everyone can be in this scenario as record labels only sign one or two new artists every year at best. You will most likely be in Scenario 2 or 3. If this is the case, you will have to do and pay for promotion in Japan yourself. The good thing is that now there are resources and services available to help you sell and promote your music in Japan the "indie" way. Another good thing is that the population of Metro Tokyo is 35 millionmore than many countries. All the buzz starts in this city and spreads across the whole country which is only about the size of California state but has a total population of 127 million. Your promotion budget goes further in Japan because you only have to concentrate on one placeTokyounlike in the USA where there are many fragmented markets (mainly due to geographic region and demographics). 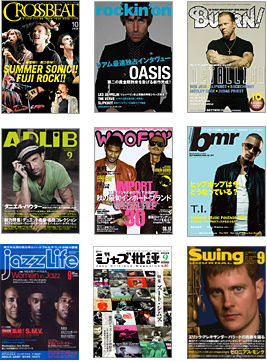 There are a variety of music-related magazines covering many genres such as jazz, hiphop/r&b, dance/club, Latin, rock and pop (a few are shown below). Most have circulations of 100,000 to over 300,000. There are also some popular free music-related papers/magazines which have over 100,000 printed and distributed in places such as music shops (HMV, Tower Records, etc. ), live houses (venues), fashion shops, clubs, bars, restaurants, convenience stores, music festivals, etc. The cost of a single ad in a popular magazine ranges. When you add translation, ad production and taxes, the costs can be several thousands of dollars for a single ad. Unless you have deep pockets and are dedicated to heavy promotion and live shows/tours in Japan, then print advertising is likely out of the reach of most indie artists/labels. 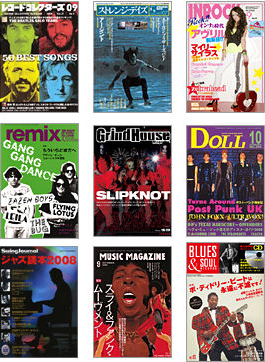 Below are some popular music magazines targeted to Japanese music listeners/consumers. There is a publication for all the main genres of music. For most foreign indie artists/labels, the most affordable and cost-effective form of promotion is online advertising and publicity. Naturally, you should start off by setting up a Japanese web/mobile site. This is where consumers will be directed to for online advertising (i.e. Google Japan Ad Network and ads in other online media) and publicity (i.e. posts, news, articles, tweets, social media, and so on). The main goal of online advertising and publicity is to drive people to your Japanese web/mobile site where they can learn more about you, follow you, and purchase your music and merchandise directly from you or from links to other stores. Most internet advertising is based on a Pay-Per-Click (PPC) system. For example, if you are running a Google Japan Adwords Campaign, you can expect to pay $0.15 to over $1 whenever someone clicks on your ad. The good thing is that you can set a maximum budget per day (avg. monthly budget). Although you could set your budget to $1/day (approx. $30/month), the higher your budget, the more clicks on your ad, and the more people directed to your Japanese web/mobile site. We recommend starting off with a budget of at least $20/day (about $600/month) for more meaningful results. At anytime after the first month, you can decide to pause/discontinue the campaign or modify your budget. The Google Japan Ad Network reaches almost 90% of all Japanese internet users. By running a Google Japan Adwords Campaign, your ads can be targeted and placed in Japan's most popular websites used by music consumers according to your budget, genre and target audience. Similarly, Twitter Japan advertising can be used to target Japanese Twitter users. Publicity means to spread or deliver information through various media to increase public awareness of someone or something. The following online media are used for promoting public awareness in Japan of indie artists/bands and their music. In Japan, "tie-ups" are how many larger record companies promote artists. A tie-up can come in the form of a song being used for a commercial or advertising campaign for another product or service (such as a new mobile phone, clothing, car, cosmetics, etc. ), or a song used in a TV show, movie, or a bonus when someone buys a product. Usually record companies with close relations with advertising agencies and producers can make this happen. The "tie-up" marketing strategy can probably be viewed as a mix of advertising and publicity (although some may say that the song is used for "free", the money that actually changes hands between record company and ad agency/client is usually not talked about nor disclosed). Unless you are under a major Japanese record label, tie-ups are likely out of the reach of indie artists/labels. In some occassions however, a TV or movie music or creative director may be looking for a particular sound (like a Hawaiian, reggae, folk, gospel, soul, or Latin jazz/bossanova song) and will seek out and discover music from a foreign artist. Oftentimes, the music will come from foreign artists who are not at all popular in their own countries but due to the tie-up, may see a sudden rise in popularity and sales in Japan. These music and creative directors search for music online. So having a Japanese web/mobile site is beneficial. Live shows/tours are the best way to establish a loyal fan base in Japan and to promote your music. It also helps in getting publicity and motivates your distributor to push your product at stores. Do not rely on booking agents because there are none (unless you are a DJ or want to work as an entertainer in a cabaret/night club/theme park). Like Japanese indie artists/bands, you have to audition, organize and pay for your shows. Performing live in Japan is NOT a revenue-generating activity, it is a promotional expense! The costs of touring in Japan will vary depending on the number of members and amount of tour support services required. In addition to everyone's transportation, accommodation, food, and other personal costs, the tour planning/management company must also be paid for its services. If you are wondering how much doing a Japan tour costs simply go to your local travel agency and ask them how much a standard tourist package would be for Japan (staying 7 days and visiting Tokyo and maybe Osaka) for the number of people in your bandthen add some extra (the tour organizer/manager also takes a fee) to come up with a conservative budget for your tour! If you have that budget ready and at least 3 to 4 months leadtime (and valid passports with no criminal records) then contact the companies that specialize in the planning and management of live tours and concerts for foreign artists/bands and labels in Japan. Click here to learn more about doing a live tour in Japan and about Japanese "live houses" (venues). If you know a little Japanese or know someone who does you might be able to set up your own gigs. Click here for info on 5,800 Live Houses, Concert Halls, Clubs, Cafes/Bars, Rental Spaces, and other Music Venues in Japan. With discount airlines and AirBnB you can set up your own Japan tour! Click here for contact information for companies that can help you arrange and manage your live tours and concerts in Japan.